It’s finally time to take the wraps off our new fall patterns and give you a preview of them. This season, we are releasing four new patterns: two dresses, one skirt and top (with a dress option), and one unisex top and pants outfit. Two of the patterns include items designed especially for knits. So, without further ado, here’s a preview of the line. The School Photo Dress is a stylish, lined, above-the-knee-length, A-line dress featuring a hidden, on-seam, front kangaroo pocket and an invisible back zipper. 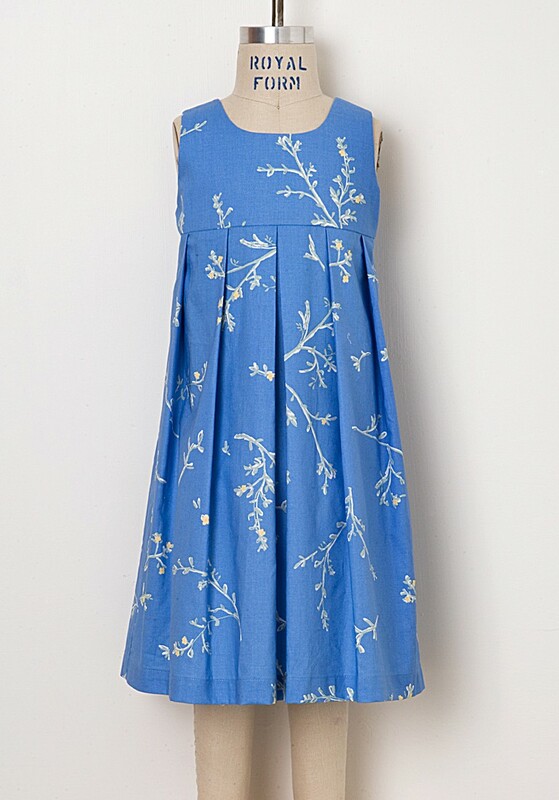 The dress comes in two views: one with a stand-away, roll collar and 3/4-length cuffed sleeves and the other (shown below) which includes a cute, feminine ruffle collar and gathered, bias-bound, 3/4-length sleeves. 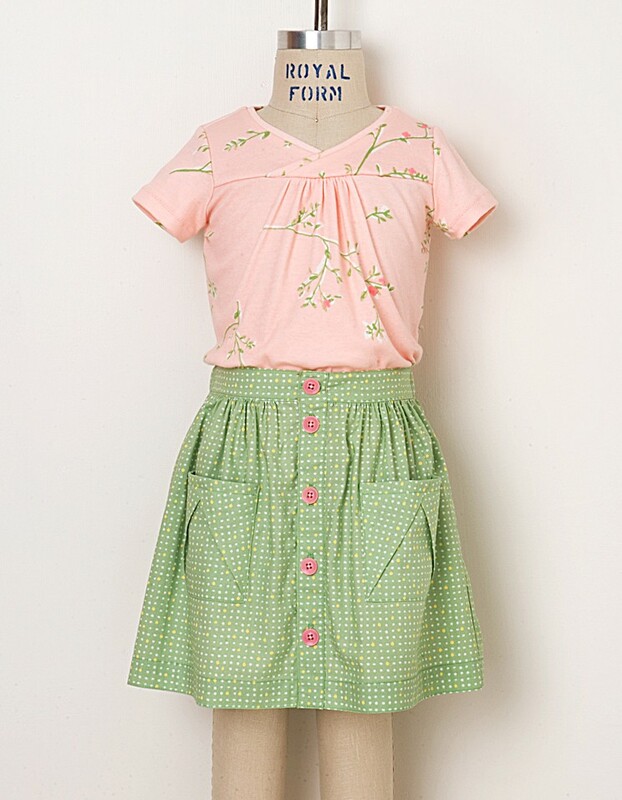 The Hopscotch Skirt, Knit Top + Dress features an elastic-back waistband skirt with front button placket and an interesting pleated pocket detail inspired by a Chinese takeout container. The pullover top or dress is designed to be sewn with knit fabrics. It includes both long- and short-sleeve options. The Music Box Jumper is an empire-waist dress that can be worn alone or layered over a blouse or shirt in cooler weather. View A (shown here) presents a softly pleated, mid-calf-length skirt. View B gives an A-line skirt with a single, inverted box pleat at center front and a decorative button tab detail. Both views button or snap up the back. 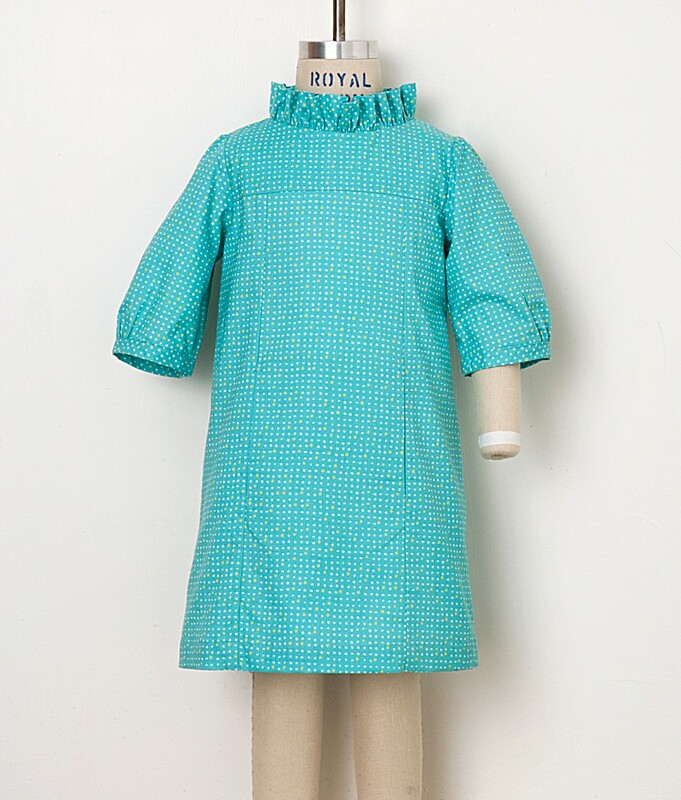 This is also one of the easiest patterns to sew that we have ever written. The Nature Walk Pullover + Knit Pants pattern includes an easy-to-sew pullover top in a color-blocked design and pull-on style pants with a hidden elastic waist. 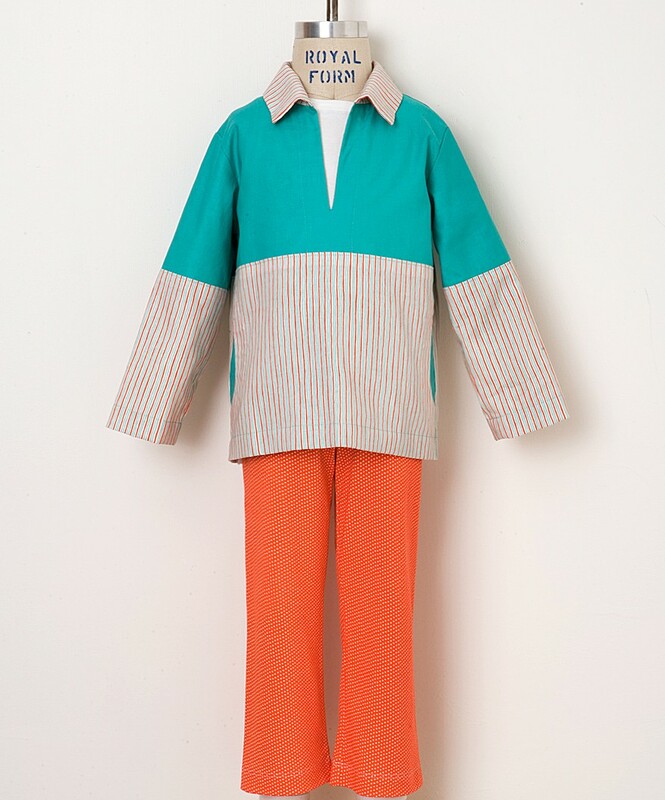 The top can be made in lightweight fabrics for a casual shirt or in heavier fabrics for use as a layering piece in place of a sweatshirt or jacket. The pants pattern, inspired by a classic yoga pant, is intended for knits. It’s a very versatile piece, and we think it’s going to become a favorite in many kids’ wardrobe because of the style and the comfort it provides when made in a soft knit. It even makes a great pajama bottom. The patterns will be available in stores worldwide and on our website starting September 7. Be sure to sign up for our newsletter to be notified when the patterns begin shipping. Wholesale customers can place pre-orders now by downloading the form from our Wholesale page. Over the next few weeks we’ll be publishing more detailed posts here that highlight all the options included in each pattern. Check back frequently to see what we have in store for you this fall. Wheeeee!!! I think my favourite is the Hopscotch, never sewn with knit before so will look forward to giving this a go. Can’t wait to see more photos and variations. Can you hear me squealing from here ! Husband came to check on me ! Hooray! The School Photo is my favorite, with the Nature Walk as a close second! Loving the long and short sleeved option pull over knit shirt!! Can’t wait to place my order!! Oh how lovely! I’ve been anxiously awaiting the announcement — can’t wait to get my hands on the Nature Walk pattern for my son. 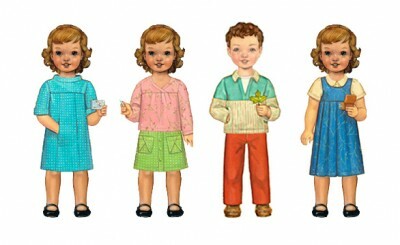 And I might have to buy one of the girl patterns and make some gifts! Lovely! Congratulations, they look wonderful. Oh they are lovely. What level are they all? Lovely! It’s all about the details for me…on seam kangaroo pocket..chinese take-out pockets! Brilliant! I would love to see view B of the School Photo Dress but the (shown here) link is not working for me. Anyone else having trouble with it? Wow, that hopscotch skirt is ridiculous!! I cannot wait for the release date! Thanks for making my Monday. Oh how exciting! I am thrilled to have Oliver and S patterns using knits. I just know the instructions will be SO valuable. I love the hopscotch and music box pattern. LOVE, LOVE, LOVE them! As always such a sophisticated take on little girls clothing. I think that’s the thing I love most about your patterns…they have that air of class that a lot of the “boutique-ish” patterns don’t have. Plus, impeccable construction. I always say that sitting down to make one of your patterns is a mini sewing class in itself. They have made me a better seamstress…not to mention the ridiculous number of compliments I get when my girls wear an oliver + s outfit. Looking forward to getting them all…especially the School Photo Dress. Devine…and I’ll take one in my size, too! I am so excited about the school picture dress. I was just thinking the other day that I wanted to make a dress like that for my daughter soon but didn’t really have any patterns for it. Thanks for making one. I love the kangaroo pocket too! Congrats on your new releases! I definitely want to try the Nature Walk pattern—I think this will work for my “tween” boys. Lovely as always! I can’t wait to try sewing with knits. I’ve been anxiously awaiting Liesl’s instructions to give knits a try! September 7th can’t come fast enough. Eek! I cannot wait to buy that dress. Such amazing detail. You’ve wowed me again. Love, love, love them all! Please tell me they include some of the larger sizes, too! What lovely additions! 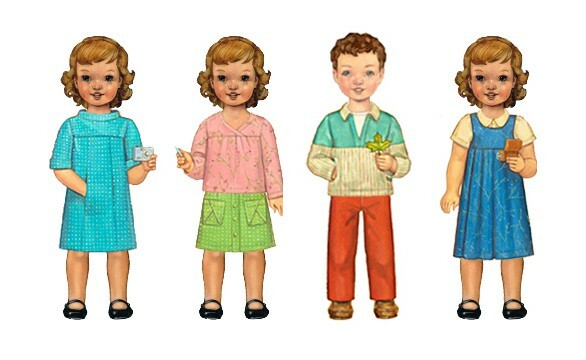 I especially like the School Photo Dress and Music Box Jumper. Cant wait to get my hands on them! Oh my goodness! I am so excited – to see the rest of the views, to order the patterns, to BUY THE FABRIC (!!!) – how will I ever wait another 3 weeks? absolutely adorable as always. I can’t wait to get my hands on them and make them up for my kiddos! 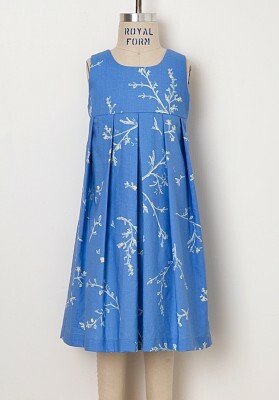 The dress’s will be perfect for the oldest for school this fall!!!! I can’t wait to make the music box jumper for my grand daughter. I can also see this with a smocked insert in the yoke. I’m especially excited by the interesting details- a rolled collar, a chinese take-out pocket. Yay! I love the music box jumper – can’t wait until these are released! All look fab! Like the idea of using knit fabric – have never sewed it before! LOVE! So excited about the Music Box Jumper – I can see this in many different fabrics. I am filling out my order form this week! Can’t wait to get these! Very excited for these patterns! Can you suggest some online sources for beautiful soft knits like the ones you’ve used in the samples? I tend to have a hard time finding nice ones at the local chain fabric stores, and I don’t know enough about what different kinds of knits are called to be able to order online with much confidence. Currently on vacation (beach and sun diet until the end of the month) with limited Internet access, I manage to get a connection to check the new patterns. Love them all (why am I not surprise with it?!). The details, the timeless lines make them a must for any sewer (at any level). Oh, and I was really surprised bu the Nature walk pattern (I was looking for a similar pattern for M gym classes). YES! Love them. Have to wait till the 1st of next month to buy them, but love them now! oh! i can’t even pick a favorite. they are all fantastic! Oh I love these! What a fantastic collection!!! Thanks for including some knit patterns too. I’m just starting to experiment with them and I’m looking forward to having them in my hand. I am going to NYC the weekend of 9/17 and am going to Purl Soho to buy up these patterns. SO lovely. Thanks for all you do.